Finally after a long time the rods are back on stock. Especially for modern carp fishing when we use an inflatable boat to bring the rods to the place and / or drill the fish from the boat. This additional brand new variant, of the "Max Nollert Temptation" range, which is highly appreciated among carpe specialists throughout Europe, is also developed for stalking or permanent residence on overgrown waters. • New ring style: BKWAG "doublefoot" specially shaped to avoid line windings. • For an extra secure and strong holding of the reel a size 18 RAMBO real seat, black edition, is installed. printed fabric case, 2 x Rod band "IF Rod Art"
As you might know, shorter rods tend to give less feeling, but have in comparison more power. And this is where we have managed to find the best compromise! We have now also achieved or maintained to keep the fine nerve and simultaneous have great energy reserve in that rod like all Temptations provide. This is done thanks to the correct material thickness and woven structure size at each centimeter of the rod. The size 18 "real seat" RAMBO has its name not without reason and keeps the reels as the Italian stallion would do! It does not have to be refixed before each session, which is especially important to us! The putover conncetion of both rod parts is extremely precise and can also be loosened comfortably afterwards, even when put together in wet conditions. We attach great importance to the complete most easiest handling of the rod! Casting with leads even of 170 g, the Temptation TEN, makes it easily for far distance. 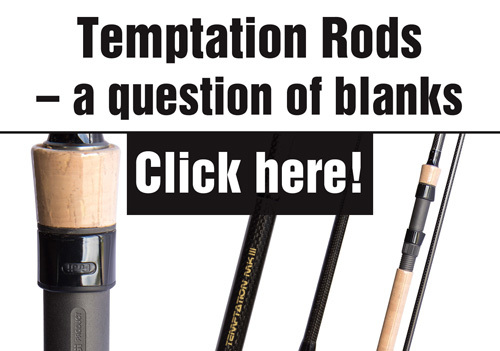 Temptation Rods - "feel the fish!" - With 14-days return policy! - When you return you pay only the shipping cost for one way! That is only 7.50 €!